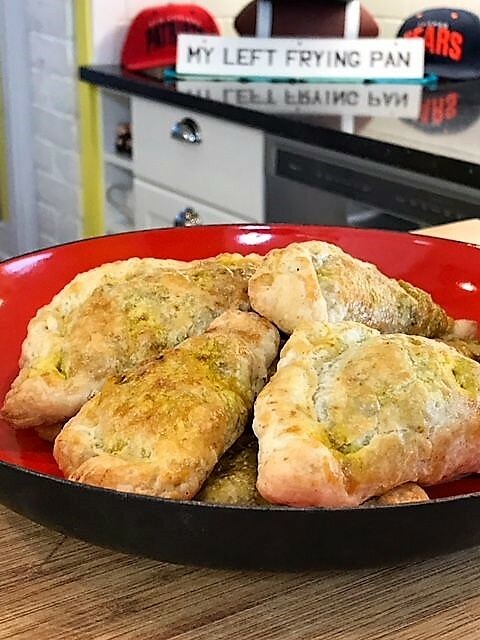 These savoury Mini Beef Meat Pies aka Hand Pies or Cornish Pasties are a total touchdown when you serve them at your Super Bowl Party or whenever you are watching a sporting event. Hearty and delicious they are loaded with beef and a wonderful blend of spices. These savoury beef mini pies use frozen puff pastry sheets. Just remember to make sure you take the puff pastry out of the freezer the night before you make the meat pies. In a small bowl, whisk together the spice mixture: cumin, coriander, pepper, turmeric, cinnamon and salt. Set aside. Heat a 12-inch skillet over medium het, add beef and brown, breaking it down into small bits as it’s cooking. Add spice mixture and stir until well incorporated. Add onion and garlic and sauté for 2 minutes. Add oil, (which I forgot to add in the video, so I added it later) tomatoes and jalapeño. Stir in well. Add water, stir in, cover, reduce heat to low and let simmer for 5 minutes. Remove lid and let cool. Can be made up to 3 days in advanced, store, covered in the fridge. When the meat mixture is no longer warm, about 30 minutes, make sure the oven rack is in the middle of the oven, preheat to 400°F and line 2 large baking sheets with parchment paper, set aside. Take one of the sheets of the thawed puff pastry out of the package. Lightly flour a clean board or counter. Place the puff pastry directly onto the board. Gently roll out the sheet until it’s 14×14-inches. I use a silicon rolling pin, so the pastry doesn’t stick to it. Cut into 9 equal squares. Scoop out approximately 1 heaping tablespoon of the meat mixture and place it in the centre of one of the squares. Repeat with the remaining 8 squares. There is enough meat to make 18 hand pies. Brush two of the surface edges with some of the beaten egg. Fold the square into a triangle, see video for the visual. Press the edges together, rolling them closed with your fingers, press with the tines of a fork to totally seal the edge. It should look like a triangle. See video. Place on prepared pan, lightly pierce the meat part of the hand pie in three different places with a fork. Repeat with the 8 remaining pies. Lightly brush the hand pies with some of the egg wash.
Place pan in the oven and bake for 18-20 minutes. Prepare the second roll of pastry and make another 9 hand pies, placing them on the second prepared pan. When the hand pies in the oven are done, they should be a deep golden brown, remove from oven and let cool slightly on the pan, serve right away or up to one hour. Can be made ahead of time and reheated on 250°F for 15 minutes or until heated through.